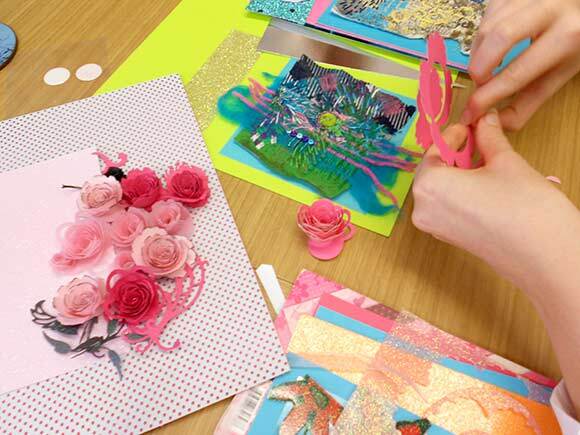 This week I’ve been busy making paper roses for a picture I’m planning to hang on my sparkly pink wall. I asked for some some help from my friend Gill and my Mum because they’re really fiddly and they take ages to make. Here’s a photo of the work in progress. 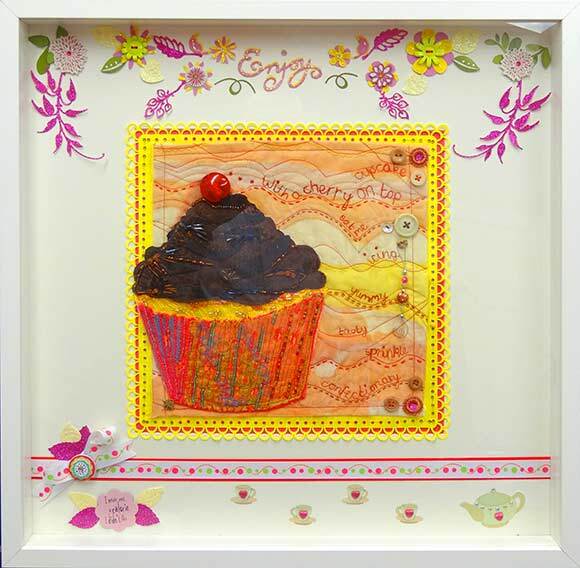 When it is finished I’ll take a photo of it on my pink sparkly wall once I am back up in Scotland. My final picture frame is made for a gift. 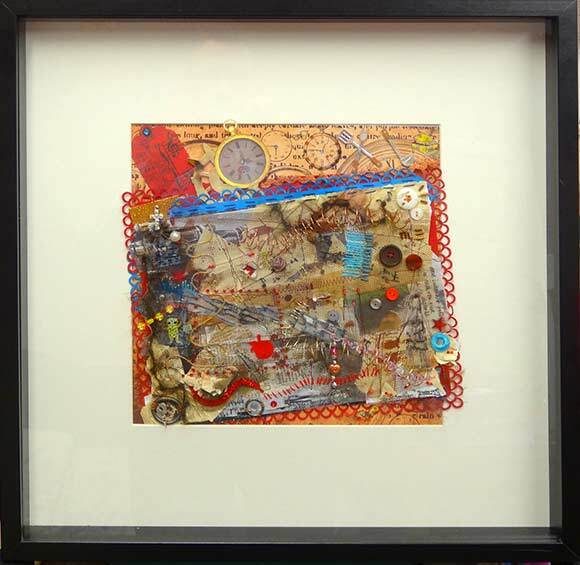 The centre piece was made as part of my exam using newspapers and sticky tape in a soak process to take text off the printed paper, stitching, netting, beading and I added some wire that I twisted in to springs along with other embellishments to add interest and depth. 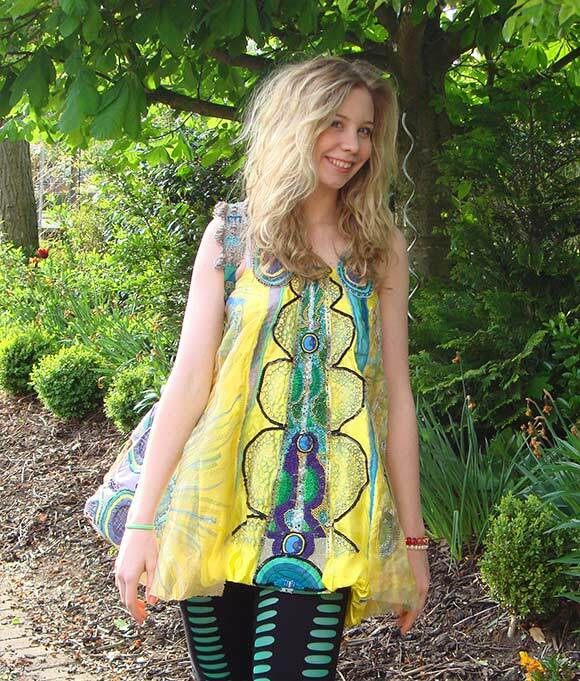 I really enjoyed doing textile classes, here’s a picture of me in my final GCSE exam design; a top (that I’ve just remembered is still at school), it started off a dress but I grew in the two years I was making it and it got too short to be a dress 🙂 There were thousands of beads that had to be sewn on which took forever. 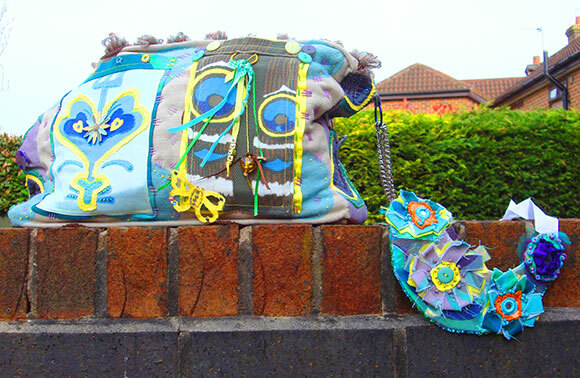 You can just see the bag that I made to go with the dress which I still use now. 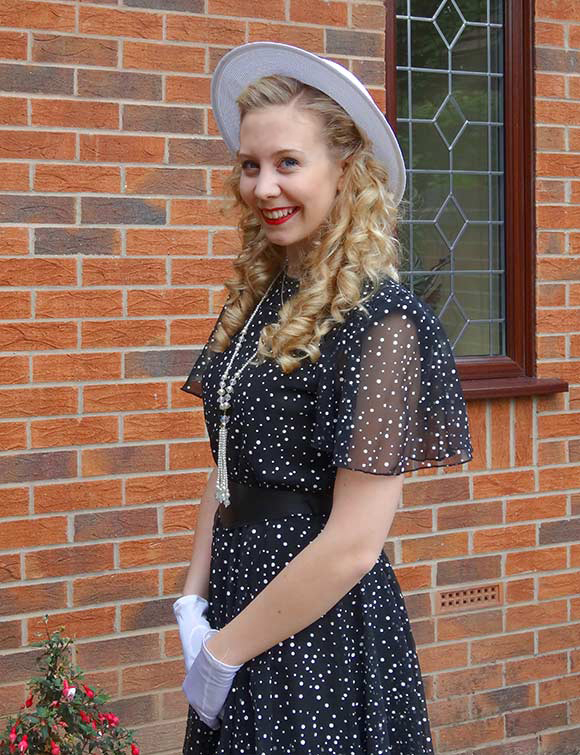 Finally, on Thursday I took inspiration from http://magicvintagespy.com/ and went to the local charity shop Age UK and managed to put together this outfit below for £20 (dress, hat, gloves and necklace) for a 21st birthday party of my friend Jess. The theme was fashion through the decades so I chose the 1940’s. I certainly generated a few quizzical stares when I got on the train and I wasn’t wearing the hat and gloves at the time so imagine the reaction if I had done that 🙂 The only problem is that my calves are still aching today after spending the whole of Saturday evening dancing the traditional Scottish dance the Ceildh (pronounced kay-lee) amongst other dances. I will be working in the sales office for the next two weeks to provide holiday cover but tonight Russell Lomas offered to accompany me on some new pieces I wanted to rehearse so that I could get some practise in. The session went great and my new repertoire is starting to take shape ready for my new College term. This is just WOW! 🙂 You are so talented! I envy you. 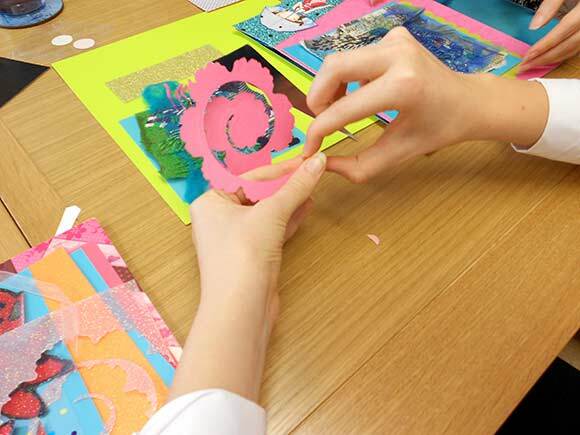 Can you put up at least one post to teach us how to make a craft like this. By the way, I envy your locks too – they are gorgeous. Thank you for such a lovely post. Hello Petal, thank you I appreciate you visiting and leaving a message for me. Thank you I’m glad you like my artwork, is Arzoo your name? I checked out your blog some great tips but your about page doesn’t give your name or town, are you in the UK? Hi Cara, I will post full details over the weekend :). They would look lovely on the place settings or to 3D enhance bunting. They are a problem to post in the mail though. 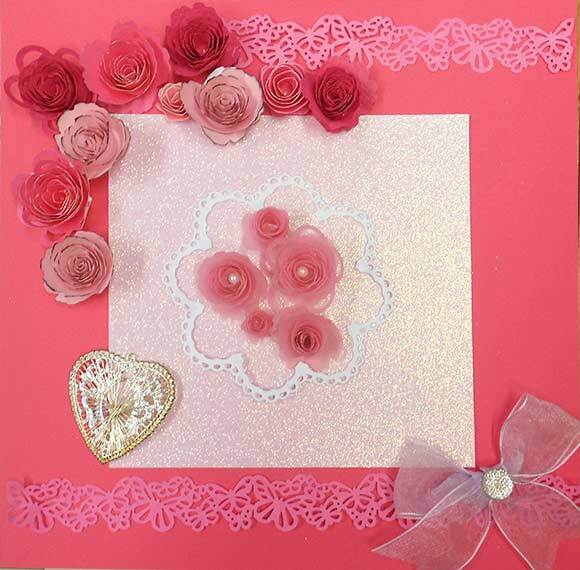 I have persuaded Gill to set up a card craft blog so when she’s got it going I’ll let you know – wedding stationery would be a great post. Thanks for following! Your blog is so lovely, and you’re super talented. I’m glad you enjoyed my blog, hope you get the chance to pop back in the future, thank you. Hi Violet, thanks a lot, lovely to have your support. Ever since my wife took a scrapbooking class years ago, I’m forever amazed at what fantastic items can be created from (what I no longer consider) throwaway stuff. You are an artist of diversity. Thanks Loujen, my Mum makes cards and after years of giving her nicest art away she decided to make scrapbooks for my two brothers and me. She chose her favourite photographs from each year of our lives and had a double side for each year then put lovely designs all around the pictures she gave Matt his when he was 18 but he asked her to carry on until he was 21 and he sent her his favourite University photos and I have done the same with mine, I make all my friends that visit at home look through my book I’m so pleased with it. You are very beautiful Charlotte, your voice is so lovely! Hi Julie, your food blog is fab too, I make a note of all my favourite food blog posts and when I get back up to Glasgow and am looking after myself I’m definitely going to try them out, I’m a lazy cook and want the least amount of washing up :). I’m going to try out your homemade pizza for sure. Thank you for following my blog and I must say, your art is very beautiful and creative of the sort. I look forward to more updates from you. Hi Felecia, thank you for your lovely message. Hope you get the chance to pop back again. the top is just too cute for words! Love the roses! Thanks for stopping by my blog and leaving a lovely comment, Charlotte! You’re welcome, hope you get the chance to visit again. Charlotte, I love your composition with watches and buttons, this is a composition that takes me on travel. Personally I would put on a black background to make it stand out even more and, you’re right, it looks like in my world … it inspires. Congratulation for your dress and your bag. The mixture of colors, texture and symbol is very nice, they give off much light as you. You have a very beautiful world. Only just seen this, what a good idea with the black background, I didn’t think of painting the cardboard frame.